Roy Hoffman established the family meat wholesaling business in 1923 when he slaughtered a single calf and sold it in the market. After that day, Roy realized the demand for a meat supplier in Hagerstown, Maryland and has seized the opportunity. He proceeded to determine and fill the needs of the food retailers in Hagerstown. Soon after, Roy's brother, Bruce, joined the company. This attitude towards quality carries on to the workers at Hoffman's. Some of the employees have been working there for decades and all of them have the same vision towards quality. Every employee takes pride in putting out a quality product. And they do their best...all the time. In 1963, the new technology of mechanical refrigeration had been developed for commercial use. This allowed major expansions to take place for Hoffman. Some years later, Roy's sons, Jacob and Robert, became the second generation to participate in the operation of the firm. "A Show ham is just another ham. It doesn't get any more treatment." The quality of Hoffman's meats allowed Don to carry away over 20 awards in national meat competitions. One time, Don had no hams to enter into the contest because they had all been promised to customers. He took a customer's ham off the rack and entered it in the show, winning a Grand Champion award. "A show ham is just another ham. It doesn't get any more treatment. I think we have the best raw products in the country," said Don. After winning these numerous awards, Don spawned their mail ordering business. 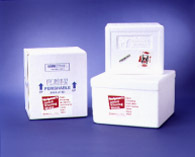 Don decided that the packaging used must reflect the quality of the meat itself and created an attractive package lined with Styrofoam to make it rigid for mailing. The mail order business is especially heavy around the holidays although orders come in year-round. "Don Hoffman maintained the tradition of a wholes sale business built on the production and distribution of quality goods." Today, Hoffman's is headed by the Trippett family who purchased the business in 2011. The Trippett family has had a long family tradition of serving the community and understands the need for quality based products in the market. Following Don Hoffman's lead, the Trippett's are committed to quality and are determined to provide the best quality products available.